Budva is a coastal tourist resort in Montenegro. It is often called "Montenegrin Miami", because it is the most crowded and most popular tourist resort in Montenegro, with beaches and vibrant nightlife. Budva is on the central part of Montenegrin coast, called "Budvanska Rivijera". It has developed around a small peninsula, on which the old town is situated. It is by far most visited destination in Montenegro, attracting mostly domestic, Russian, Serbian and other Eastern European tourists with an old town, bars and nightclubs, and beaches mostly consisting of small rocks. It is base for mass tourism, while in its near vicinity there are luxury resorts such as Sveti Stefan and Miločer. There are as many as 35 beaches in the Budva area, mostly rock and a little sand (8 beaches are marked with blue flags). During the summer in particular, the day and night-life offers opportunities to enjoy theatre plays and performances, music events and entertainment programs. Many nightclubs use go-go dancers to attract customers, and families might be offended by the open display of almost-naked girls in the street. There is mainly one street, the main promenade, where all the action happens. Budva appears to be undergoing poorly planned, unchecked growth with towering unattractive apartment buildings and hotels being built wherever there is open space - which unfortunately includes building directly on the beach. Some tourists may find Budva disappointing and cheesy because of the over-crowded beaches filled with chairs, umbrellas and loud music in some places. Prices for food and accommodation are also well above what can be found in less popular resorts. The old town is adjacent to the marina, where the wealthy come to moor their luxury yachts. The old town is small but beautiful, with restaurants and boutiques selling luxury goods at high prices. Dubrovnik Airport (DBV) in Dubrovnik, Croatia is 80km away from Budva, and maintains flights to many European destinations throughout the year, providing a good alternative to the Montenegrin airports. A taxi to Budva will cost €90. Budva is very well connected by bus with cities within Montenegro and major cities in neighboring countries. Check the online bus schedule. Buses are usually on schedule though the schedules vary from season to season, with more buses running during the summer. +382 33 456 000. The bus station is a 20 minute walk from the old town. Buses from Skopje operate 3 times a week, take around 12 hours, leave at 8pm, stopping at Podgorica and cost around 17€. Check schedule at Skopje Autobuska Stanica. Buses to Sarajevo run daily at 8:10 (Balkan Express minibus) and the journey takes about 7 hours, stopping at Podgorica and other cities. €16.5 one-way. To Belgrade, there are around 4-5 buses a day and the trip takes 12 hours (27€). Buses to Herceg Novi (and vice-versa) run daily approximately every 30 minutes. The journey takes 1.5 hours and costs around €6 one-way. Buses to Dubrovnik continuing to Split run 3 times a week. There are daily buses during the summer in the morning (check current bus schedule for accurate time) which can get full quickly so arrive early to get a ticket. The journey takes around 3 hours. There is a spectacular view from the bus during this route. Budva can be reached by car using the coast road, which is in good condition. Travelling from Dubrovnik, this can take less than 2 hours depending on traffic. A short €5 ferry journey saves the drive around the bay of Kotor. If you came to Budva with your own car, use it inside the city only when you have to. Traffic is terribly congested during the summer, and parking spaces around the old town are almost impossible to find, and very expensive when you do. Taxis are abundant in Budva, but are not cheap - a ride anywhere within Budva will cost you around €5 - and prices vary depending on which taxi company you happen to get. Try to choose a taxi that has a rate card displayed and a meter visible on the dash - and then watch to ensure the meter is set appropriately when starting - to avoid getting ripped off. Halo Taxi charges on the higher (rip off) end and Joker Taxi charges on the lower (fair) end. Taxi drivers are also known to lie to tourists about public bus service such as operating times and stop locations. There are many tourist boats that dock in Budva harbor which offer rides to nearby beaches, Sv. Nikola island, or one-day trips to various destinations on Montenegrin coast, but these are also expensive. Unlike other seaside cities, there are no €1 water taxis here. Be aware that ATMs (locally referred to as Bancomats) in Budva are rare in the old town, but plentiful outside of its walls. Old town is packed primarily with little boutiques, such as Prestige, selling costume made dresses. There are other boutiques selling everything from expensive shoes to clothing and jewellery, but ALWAYS beware of counterfeited variants of world famous brands. The main Budva promenade has a long string of stands with very cheap - in quality, not always in price - clothing, sunglasses, souvenirs, etc. Friendly service in Budva shops is not the norm. Service people usually do not smile or make eye contact and are often brusque; however, this is slowly changing. There is a wide choice of places to eat at in Budva. In old town you will find almost anything: from pizza-places, bakeries to seafood and Chinese restaurants. Across the harbor, at the very coast, there are some premium fresh seafood restaurants, notably "Jadran" and "Donna". Along the entire promenade there are many fast food places, offering barbecue, giros, pancakes, slices of pizza, icecream...with affordable prices. A McDonalds seasonal restaurant is open on the promenade during the summer. Budva is full of cafes, bars and nightclubs. During the high season it is hard to find a place to sit. Espresso will cost from €1 to €1.50. Coke and other soft drinks and juices will cost from €1.50 up to €3.50. Local beer costs an average of €2.50 and mixed drinks can go from €7 and up. Bars are allowed to play music until 1AM, when the crowds move to some of the nightclubs. Always ask for a bill, as they must provide it by law. If you don't - it's likely that they'll overcharge your drinks, especially if they see you are a foreigner! A form of tourist scam in Budva bars and restaurants is that you give the waiter, for example, a €20 EUR banknote and expect him to bring back the change in a while. He does not, and when you ask him to come over, he will tell you that you did not give him €20, but a smaller banknote. He will also show you that in his wallet he only has €5 and €10 banknotes, so there simply could not have been a €20 banknote on your table. To avoid this, your only solution is to say out loud the amount of money when you are giving it and if you are in a group, make sure the others see and hear this as well. Try to learn the numbers in local language as saying the amount in English does not help you much - the waiter will pretend he does not understand. There are a variety of bars and clubs to go out in Budva. 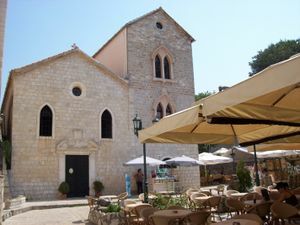 There are many outdoor bars and cafes just located outside the walls outside of Stari Grad. Most play loud club style music. Accommodation in Budva is abundant, and varies from renting a room for €10-15 to handsomely priced five-star hotels. There are big differences in prices of accommodation - not only between types of accommodation but for same accommodation during different times of the year. For example, a hostel-like room that rents for €7 per person/per night during the off-season can rent for €20 and up per person/per night during July and August. There are 84, mostly three- and four-star hotels (capacity of over 13,000 beds), about 100 private villas and bed and breakfast inns and private accommodation (60,000 beds) of various options. During the summer it is easy just to come to the bus station and find local people offering rooms. Be aware, though, that there is a problem with water in Budva, and you should confirm that the accommodation you choose has running water. The prices range from €7 to €15 for a person/night/private room, with the cheaper rooms requiring a shared bathroom and/or kitchen. Don't worry about being connected - the entirety of the Stari Grad is covered by free municipal WiFi that works reasonably well. In the area of the Marina you can also pick up free WiFi. As always on public WiFi, be cautious about entering in sensitive information (banking info, email passwords) as you never know who is on the other side of the connection. A private VPN is a safe way to protect your information. It's rather easy to buy a sim card with local number and some inexpensive 3g internet plans. As of July 2016 it costs 3,5€ with 3€ balance covering 2,99€ tarif of 1,5Gb for 7 days. Be ready to show your passport or register it later. Sveti Stefan can be reached by bus (€2) or by a 10km hike. Ulcinj - Several buses leaving early morning around 7, schedule changes frequently so inquire at the bus station for specifics. This page was last edited on 8 July 2018, at 04:12.